Chocolate Cream Pie is rated 4.8 out of 5 by 6. Rated 5 out of 5 by BethC17 from Fantastic delivery and yummy pie! I sent my brother a chocolate cream pie for Thanksgiving. He recently moved to Fort Lauderdale and it would be our first Thanksgiving apart in 30 years. The pie arrived the day before Thanksgiving and was fresh (&cold!) when my brother got it. He said it was delicious and it gave him a sense of “home”. I will definitely be ordering again !!! Rated 5 out of 5 by Debs from Great Pie Delicious pie and truly wonderful customer service!! Rated 5 out of 5 by favdaughter from Delicious! I sent this to my dad for Father's day since Choc. Cream pie is his favorite. A little worried as to how it would arrive I live in MA he lives in NC -- extremely hot and humid some days.. I spoke to Customer Service and they assured me the package would arrive in a cooler with dry ice and the fact that they were in NC was not an issue. They were absolutely right, not only did the pie arrive in perfect condition, I was told that it was delicious, in my parents words "it was a real Choc. cream pie". They really enjoyed it. Rated 4 out of 5 by mmed from More fluffy My personal preference is for a little more fluffy, less moussy chocolate filling but it was still very good. Rated 5 out of 5 by John Sandy from Daniel and Chloe's Halloween gift. The quality was excellent and the grandchildren enjoyed. 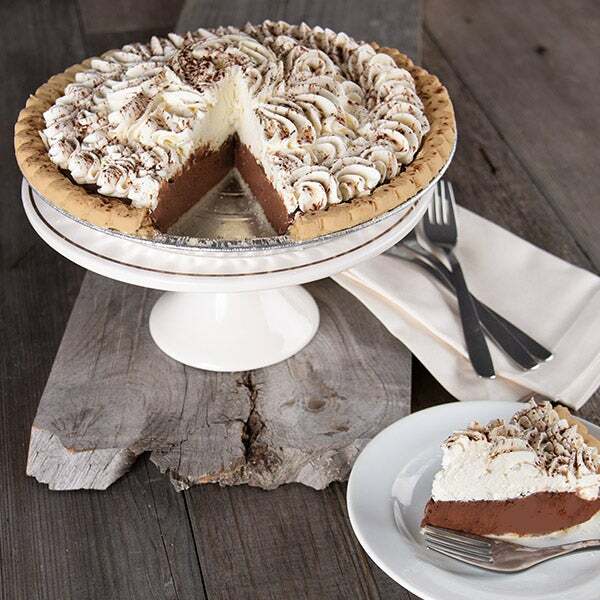 Few desserts are as delicious as our Chocolate Cream Pie! We create the blissfully smooth filling by gently folding together fresh buttermilk and the finest quality semi-sweet chocolate and then pour it into our signature buttery crust. Artfully topped with peaks of our homemade whipped cream and garnished with rich chocolate shavings, this exquisite dessert is impossible to resist!